From weddings to anniversaries, eternity bands present a classic twist on a traditional band and can elevate any ensemble to reflect your personality and your commitment to your spouse. If you have never considered wearing diamonds until now, take a closer look at what makes our men’s 14k white gold wedding ring with 8 round diamonds so special. For many years, diamonds have been the primary symbol of love and prosperity. Because diamonds are one of the hardest natural substances found in the world, they have also come to symbolize perseverance. The exceptional pairing of silver and shimmering hues in our 4mm men’s 14k white gold wedding ring with 8 diamonds will leave you and your bride speechless. From its designer bezel setting to its comfort-fit design, this ring has a little bit of everything for every kind of masculine style. While many couples search for platinum or alternative metals to choose for their wedding bands, white gold holds an inherent value that’s been treasured by many civilizations for hundreds of years. 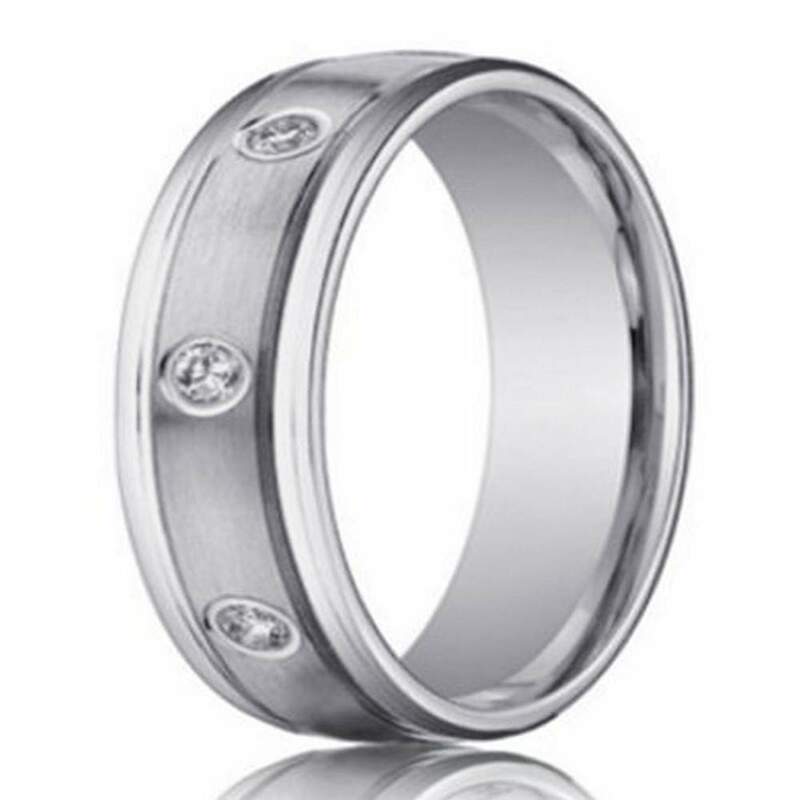 Thanks to its sturdy construction and the perfect alloy of pure gold with white metals such as nickel, silver, and manganese, 14k white gold will never tarnish, corrode, or rust. Invest in enduring quality that you can love for a lifetime by selecting our men’s 14k white gold wedding ring with 8 round diamonds. This ring is available in other widths. Please contact us for a quote.